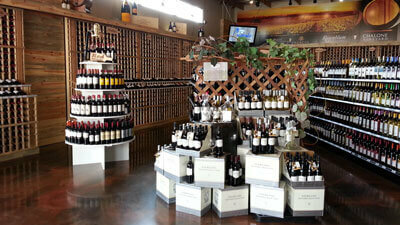 Each Month we hand Select a Winery and Feature it as our Winery of the Month. 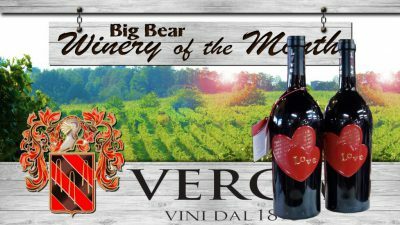 This February we Picked Love Wine by Natale Verga. The perfect bottle of wine for Valentines Day. 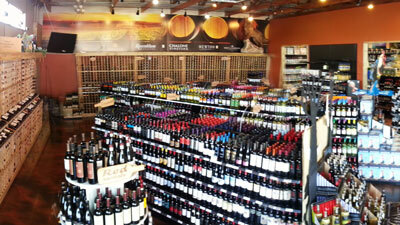 Big Bear offers a beautiful selection of wine that is sure to satisfy wine drinkers of all types! Our wine catalog is constantly expanding, striving to meet the needs of our customers. If there something we do not carry we will be happy to see what we can do to bring it into our store. Here’s a little list of tips, tricks and fancy wine words for your pleasure! To view a printable list of wine vocabulary words, click here. Wine is any fermented fruit juice. People typically associate wine solely with grapes and it’s true that the vast majority of all wine that you’ll find almost anywhere is fermented grape juice, but wine can technically be made from other fruits like blueberries, raspberries, and strawberries. Grapes have become the standard for wines for two reasons. First, there is an acid found in grapes but not other fruits which preserves the juice for decades or even centuries. Second, there is a lot more sugar in grapes than in other fruits and this helps produce stronger wines because almost all the sugar is transformed into alcohol. Why Does Wine Taste the Way it Does? And this is just the beginning of what makes wine what it is. What is a Varietal? – Varietal refers to the type of grape that is used in making wine. Barbera is a red wine grape found primarily in Italy’s Piedmont region. It produces hearty red wines with deep ruby colors, full body and low tannin levels. Cabernet Sauvignon is a red wine known for its depth of flavor, aroma and ability to age (present by the wine’s noticeable tannins). It is full-bodied and intense, with cherry- currant and sometimes herbal flavors. These wines are made effervescent by a secondary fermentation in the wine-making process. Champagnes and sparkling wines range in style from very dry (Natural), dry (brut) and slightly sweet (extra Dry) to sweet (sec and Demi-Sec). Many sparkling wines are also identified as Blanc de Blancs (wines made from white grapes) or Blanc de Noirs (wines produced from red grapes). *Champagne is only called Champagne if it comes from the Champagne region of France. One of the world’s most popular wines, Chardonnay is a white wine originating from Burgundy. Flavors range from clean and crisp with a hint of varietal flavor to rich and complex, vanilla, butter and oak-aged wines. Chardonnay typically balances fruit, acidity and texture. Chenin Blanc is a white wine with fresh, delicate floral characteristics. It grows well in warmer climates and produces light, well- balanced wines ranging from dry to off-dry (slightly sweet) styles. Invented by Robert Mondavi in 1970, Fume Blanc is a Sauvignon Blanc that has been fermented in oak. Gewürztraminer is a white German wine that produced distinctive wines rich in spicy aromas and full flavors, ranging from dry to sweet. This varietal is a popular choice for Asian dishes. Merlot is a red wine with medium to full body with black cherry and herbal flavors. Merlot is typically smooth, soft and mellow. This warm-weather, red wine grape is common in Southern Frances’ Rhone Valley. Rich in color with early aromas, often blended with Syrah. Petite Sirahs are inky red wines with firm, robust tannic tastes, often with peppery flavors. Petite Sirahs may complement meals with rich meats. The low acidity of this white grape helps produce rich, lightly perfumed wines that are often more colorful than other whites. Pinot Noir is the world famous grape from Burgundy and more recently California and the Pacific North West. A light to medium-body wine, pegged as one of the most difficult to grow and make. Delicate and smooth with rich complexity, Pinot Noir is a versatile dinner companion. Riesling is the classic white wine grape from Germany and known for their floral perfume. Depending on where they’re made, they can be crisp and bone-dry, full-bodied and spicy or luscious and sweet. Rosés, also called blush wines, are light pink wines made from several red wine grapes. They get their color from a very short period of contact with the grape skins during the wine-making process. Rosés are light, usually somewhat sweet and best served well-chilled. Sangiovese is best known as the Italian red wine, Chianti. Hearty and dry it often displays a distinctively smooth texture with spice, raspberry and licorice flavors. Sauvignon Blanc is a white wine best known for its grassy, herbal flavors and is a popular choice for shellfish or as a refreshing alternative to Chardonnay. Syrah can produce giant red wines with strong tannins and complex combinations of flavors including berry, plum and smoke. It’s known as Shiraz mainly in Australia and South Africa. Viognier is a rare white grape growing in popularity for its uniqueness. It is an aromatic variety typically displaying peach, apricot and sometimes spicy flavors. Zinfandel is a medium to full-bodied red wine with and berry or spicy, peppery flavors. Great with pizza and tangy barbecue sauce.